Fourth Division: River champ! José Luis Vidal's team, defeated San Lorenzo by penalties and remained with the title in the AFA tournament. 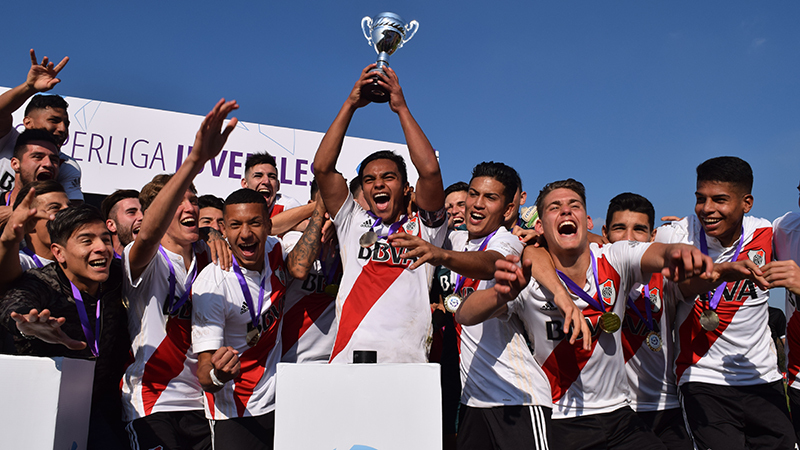 The great campaign of the Fourth Division had its golden clasp this Friday at noon: in the grand finale, played in Vélez Olympic valley, River defeated San Lorenzo, and performed a well-deserved Olympic round. After ninety really intense minutes, but without any of the teams really taking advantage of each other, “El Millonario” showed its power in the penalty shootout. The goals scored by Federico Girotti, Santiago Vera and Elías López, (added to the saves of the hero of the day, Juan Martín Rojas, who contained two shots and the other was deflected by the rival player) sentenced the series in River’s favor. After penalties, the long-awaited riverplatense celebration begun: hugs between all the players and members of the coaching staff, Olympic round and of course, the cup held up high for the new champion of the Fourth Division. After the penalty shootout, Rojas, the goalkeeper said: "it’s the whole group’s achievement, we always pulled forward and never stopped. That’s how we got the expected results". He also added "we had been practicing the penalties. The tactic was to wait until the last second for the kicker. And after acing the first one I got super confident". Matias Sanchez, the team’s central and captain, also expressed his feelings: "It is great happiness to me, because the whole group fought from the beginning and we were prepared for every situation." The team's commitment was seen in every training and in every match, and over the course of the tournament, we gained strength as a team. " "¡I’d never imagined the joy of being champions in such a club!" Sanchez concluded. River: Rojas; Paredes, Aguirre, Sánchez, K. Gallardo; Grosso, Barrios, S. Vera; Rodríguez Puch; Girotti, Greffe. Substitutes: Montagnino, Zicarelli, E. Lopez, Chocobar, L. Vega Albornoz, Castillo, P. Núñez. DT: José Luis Vidal.